Halloween isn’t just for kids, and it's not all about the candy, either. People of all ages in Miami enjoy a good scare in a spooky setting, and, fortunately, there are several, epic haunted houses providing just that in October. So choose your costume, find a sitter for the kiddos, and get ready to have a goul-ish great time at the best haunted houses in Miami! Halloween never ends in Wynwood as the ParanoiaMiami celebrates this holiday all year-round with a black-out horror maze. 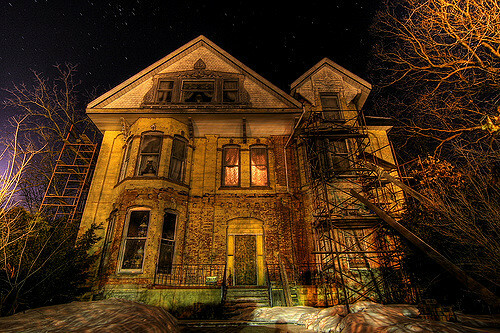 Be warned, this isn't an haunted house and will leave you tossing and turning in your sleep for days! Tickets are currently $24.99 per person on their website, and it’s a small price to pay for a scare of a lifetime. This 18-and-over event runs October 27 and 28 and features many popular artists such as Wiz Khalifa and Porter Robinson. But Wynwood Fear Factory more than just a concert- there will be several haunted houses keeping all who attend on the edge of their seats. There will also be scare zones and, once you enter, there’s no guarantee the you will come out with your sanity! The Wynwood Fear Factory will also have tons of food and many 21-and-over bars, merchandise booths, and art installations. Early bird tickets for a two-day pass are on sale on their website for $80.00 and the Early Bird 2-day VIP (21+) are going for $140.00 and include VIP express entry, a private VIP viewing area, and dedicated restroom facilities. If you enjoy a good scare and an equally good time, make plans to visit one of Miami's best haunted houses this Halloween season. Running from September 27 through November 3, House of Horror Haunted Carnival in Doral is one of Miami's largest Halloween attractions and brings two, terrifying haunted house experiences for those who dare enter. First, there's Blossom LN where guests are taken on a tour of the only remaining house still standing. Although it should stand abandoned, you may encounter some unwelcomed inhabitants! Those who have the guts are then granted maximum security clearance at Area 13, rumored to be the location of many mysterious deaths and supernatural happenings. If you think you can handle the truth, just follow the unmarked road just past the junkyard where Area 13 awaits. Ticket prices vary from $15.00 to $30.00. All tickets include one admission to both haunted houses plus unlimited attractions and carnival rides; there will also be food and games. For more Halloween events in Miami, register on 305area and connect to everything going on in the Miami area.